Steeped in history, yet hip and lively, enchanting Toulouse is one of France's most beautiful cities. Known as the Ville Rose (the 'Red City'), the capital of western Languedoc-Roussillon is an attractive place to visit. Add to that the wonderful shopping options and you have a great destination. Finally, the food here and in the rest of the Midi-Pyrénées region, of which Toulouse is the capital, is among France's most memorable. The shopping options are vast. The city's Capitole building, with the typical pink stone of Toulouse's buildings, and the capital square, serve as a hub of activity. Shops and cafés line the perimeter, and a massive market is held here every Wednesday. Toulouse is France's fifth-largest city and is known as one of the best places to live in France. Some of France's best cities and attractions are mere minutes or a couple of hours from Toulouse. Toulouse makes a central point between the Mediterranean Sea and the Atlantic Ocean. The Pyrenees, and Spain and Andorra, are nearby. Toulouse is served by Aéroport Toulouse Blagnac. From the USA there are no direct flights; you will have to go via Paris or, Madrid. Many European airlines, such as Air France, British Airways and Lufthansa, serve Toulouse and make the initial stopover in their home countries. You can also fly into a major European city like Paris, and take the train to Toulouse. Check out the detailed information on how to get from London, the UK, and Paris to Toulouse. Toulouse and the surrounding area are well served by its public Metro transportation system. It can be used to reach or get close to anything in the city. Toulouse is also an ideal city for walking and general wandering on foot. The Capitole, without a doubt, is the city's main attraction. The impressive architecture is marked by its pink facade and numerous elegant columns. La Cathédrale Saint-Etienne is an odd and intriguing mix of styles spanning five centuries. In homage to Toulouse's position as a major aerospace center in Europe, La Cité de l'Espace is a must-visit for any science, air or space fanatic. Discover the wonders of the city by river instead of land with Parisian-style tourist boats of Toulouse Croisières, which wind a path along the Garonne River. 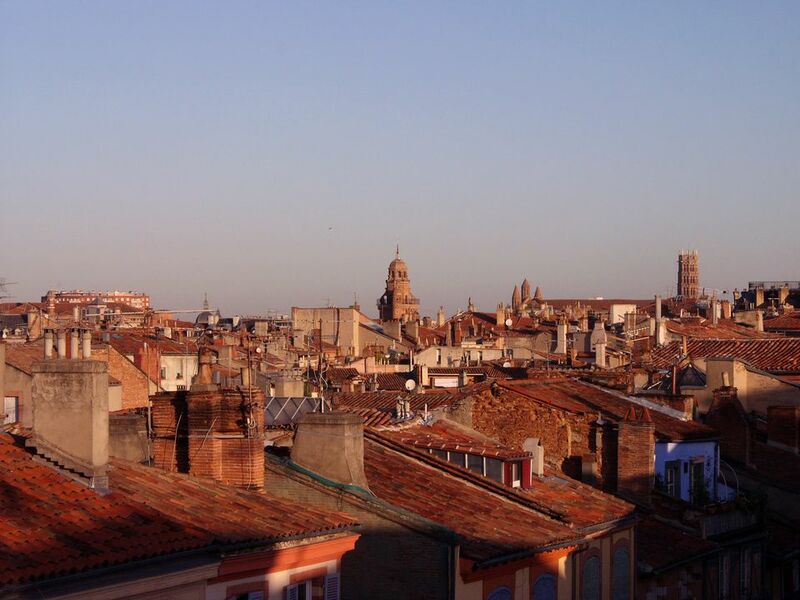 Read about the Top Attractions in Toulouse. Bordeaux, a thriving city filled with shops, amazing historic attractions and nestled in the heart of wine country. It's about two hours away by train. Carcassonne features an entire city that is a castle, in La Cité, the medieval fortified upper city. It's about 45 minutes away by train. Montségur has almost a cult following, attracting Cathar history enthusiasts, hikers, and lovers of charming small French villages. There is no train station in Montségur, but you can rent a car and drive there in about 1 and a half hours. To the northeast, Albi has a remarkable episcopal center, now a UNESCO World Heritage Site. Albi is also known as the hometown of the great, and in his time, notorious painter, Toulouse-Lautrec. Visit the museum for a walk past all those wonderful posters of Parisian life. The Crowne Plaza truly has it with its prestigious Place du Capitole address. This centrally located hotel features good amenities like high-speed Internet access. The hotel is quite reasonably priced considering the amenities and location. Read guest reviews, compare prices and book on TripAdvisor. The ultimate place to stay in Toulouse has to be the Grand Hotel de l'Opéra. The hotel, a converted 17th-century convent, rooms that are amazing and a wonderful restaurant. Best of all, the address is 1, Place du Capitole. Read guest reviews, compare prices and book on TripAdvisor. Read about more hotels in Toulouse, check prices and book on TripAdvisor.